Take-away: Identify your fundraising weaknesses and turn them into strengths. Snakelike, you strike, slamming the snooze button. Buzz, buzz, buzz… BAM! You hit snooze again. It’s Monday, your room’s frigid and it’s toasty under your quilt. You, my friend, have a serious Activation Energy Barrier (AEB). We develop strategies to lower our morning barriers, such as laying clothes out the night before, and for overcoming barriers, such as coffeemakers programmed to awaken us with the seductive scent of java. Similarly, you can develop strategies to lower or overcome your barriers to fundraising. But first, you must know what those barriers are. Try this little exercise. ___ They’ll feel like I’m using our friendship to get money. The more Yeah, buts… you have, the higher your score. If you checked only one or two, you can probably overcome them by using my five-step method (see below). If you checked all nine and listed one or more besides, you’re a 10, and may be unable to ask at all. If you’re fearless, if you checked none of the above, what are you waiting for? Stop reading this blog and go ask for a gift! The good news is, I don’t want you to ask your friends to give if you think you’ll alienate them. I don’t want you to ask if you don’t know how much to request, if you don’t know what to say nor if you have reason to believe they’ll turn you down. I want to show you how the flip side of your fear is often your asking strength. Playing to your strengths, you can overcome your fears. For example, if you checked # 1-4 above, you probably have great social skills, like my friend Lara, a therapist. Rather than asking directly, you might facilitate a conversation between your donor friend and your nonprofit’s CEO that results in a gift! Everyone is different. Discover your Asking Personality to learn who, where, when, how you should ask, and how you can do so in ways at which you’ll excel. You can learn more about my five-step method and discover your Asking Personality, in my book Nonprofit Hero, Five Easy Steps to Successful Board Fundraising, available on Amazon, or for free by request from your local library. 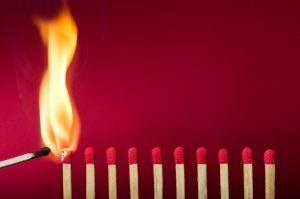 Ignite the spark that will overcome your fundraising activation energy barriers.